Sunday, April 14th Men’s Fellowship Discussion and Planning, 9 AM – 10 AM, 3rd Floor Library. Men of the church are invited to a before worship chat about men’s issues and activities of the Men’s Fellowship. The Fellowship has traditionally provided support and friendship among men in the church, as well as an annual retreat, nature walks, and maintenance of the church building. Contact Bill Blakely or Ron Weisberg with questions. The 2019 PCD Annual Meeting will be held online on Saturday, May 11, 2019, 2:00-3:30 p.m. PT. This will be exclusively an online meeting. There will be no local gathering. Please contact Rinda Bartley, if you plan to participate in this online District meeting. She will let you know how to register, and share information about becoming a delegate from our church. Instructions for connecting to the meeting will be shared by May 8 with all who RSVP. 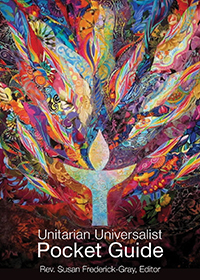 General Assembly (GA) is the annual meeting of our Unitarian Universalist Association (UUA). Attendees worship, witness, learn, connect, and make policy for the Association through democratic process. General Assembly 2019 will be held June 19-23, in Spokane, WA. This year’s theme is “The Power of We.” In a time of great challenge and heartbreak in our world, what does our faith demand from us? At this year’s General Assembly we will explore the power, possibility, purpose, struggle, and joy of finding the path forward together as Unitarian Universalists. Attendees will leave inspired, with the tools needed to carry on the work into their own congregations and communities. Join us as we work for collective liberation inside and outside our faith. If you are considering attending GA this year and would like to represent this congregation as an official Delegate, please contact Rinda Bartley.